One type of BB gun uses a spring-driven plunger to blow the BB from its barrel. (a) Calculate the force constant of its plunger’s spring if you must compress it 0.150 m to drive the 0.0500-kg plunger to a top speed of 20.0 m/s. (b) What force must be exerted to compress the spring? This is College Physics Answers with Shaun Dychko. The maximum speed of the pellet in this BB gun is going to be occurring right after this spring is done extending, just before the pellet leaves the spring. And at this point, the spring will have no potential energy and it will have all kinetic energy. Whereas at the beginning, when it was compressed and at rest, there was no kinetic energy and all the energy was stored in elastic potential energy. So this elastic potential energy of one half times spring constant times the amount by which the spring is compressed in squared equals the final kinetic energy, one half mass of the plunger times the final speed squared. Notice that we're neglecting the mass of the BB pellet in this question. So, we solve for k by multiplying both sides by two over x squared and you get k is mVf squared over x squared. 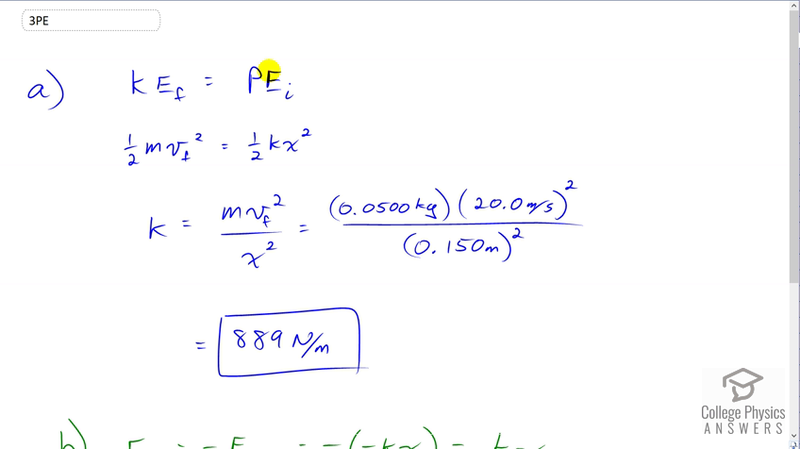 And so we're told that the mass of the plunger is 0.05 kilograms times this 20 meters per second maximum speed of the pellet or plunger squared divided the amount by which the spring was compressed of, 0.15 meters squared giving us 889 Newtons per meter is the spring constant. And then a different question is, how much force must be exerted to compress the spring? Well, the external force that's going to be applied to compress the spring will be in the opposite direction to the force that the spring itself exerts. And so that's going to be negative of negative kx which is positive kx. And so, the force is going to be the spring constant, 888.89 Newtons per meter times 0.15 meters compression and this gives 133 Newtons.